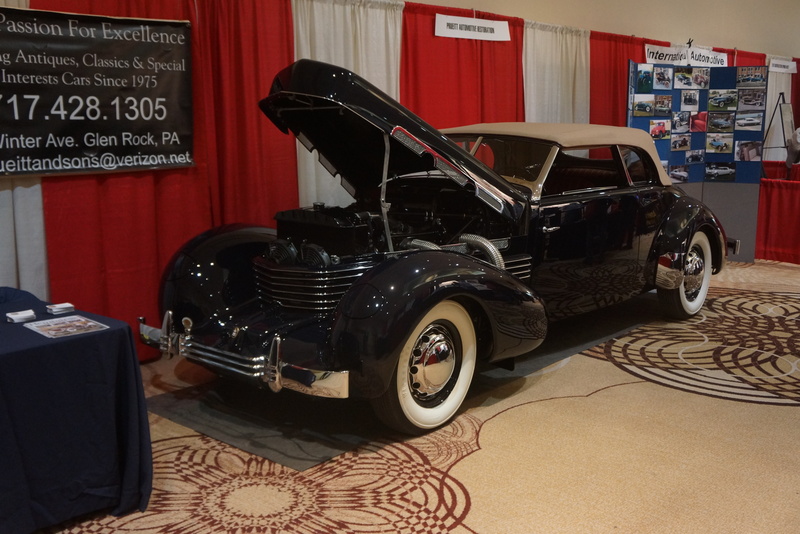 The Antique Automobile Club of America (AACA) held its 82nd annual meeting in Philadelphia PA, from February 8-10, 2018. There is a long history of annual meetings for the club in this city. This was not the first such meeting I’ve attended, but it has been a while since I’ve headed down there. 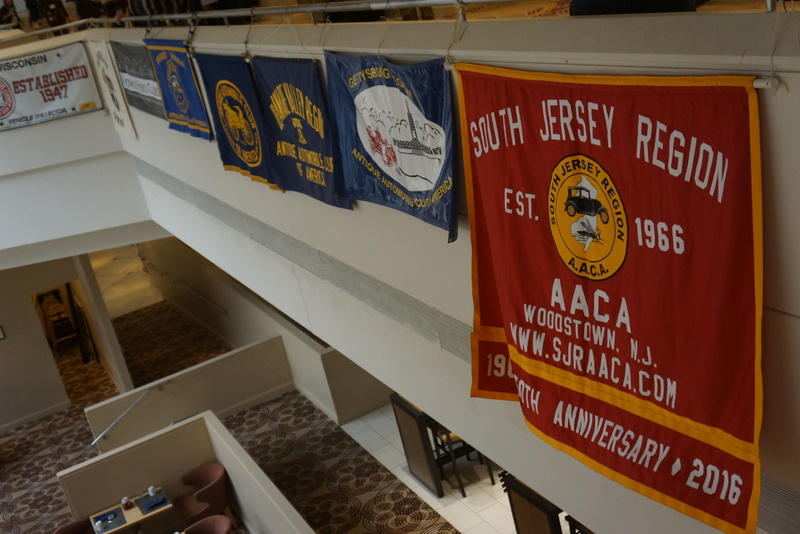 There are years when the Atlantic City Car Show and Auction conflicted with the timing (as was the case this year), but I chose the AACA meeting. The primary purpose of the annual meeting is the Saturday banquet, during which prize winners from the previous year are recognized. There is a General Membership Meeting on Saturday afternoon. Other meetings for officers, Regional Presidents, and judges are also scheduled. 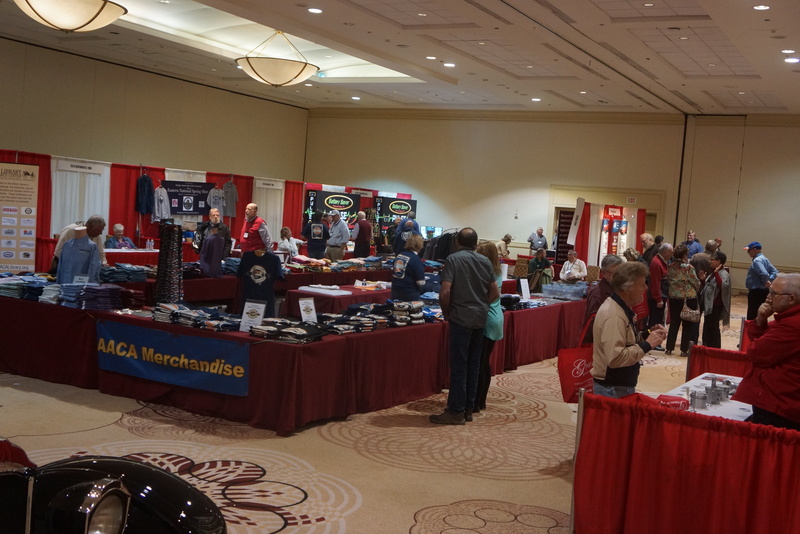 Seminars on various topics of interest to the hobby are held all day Friday, and half the day on Saturday. 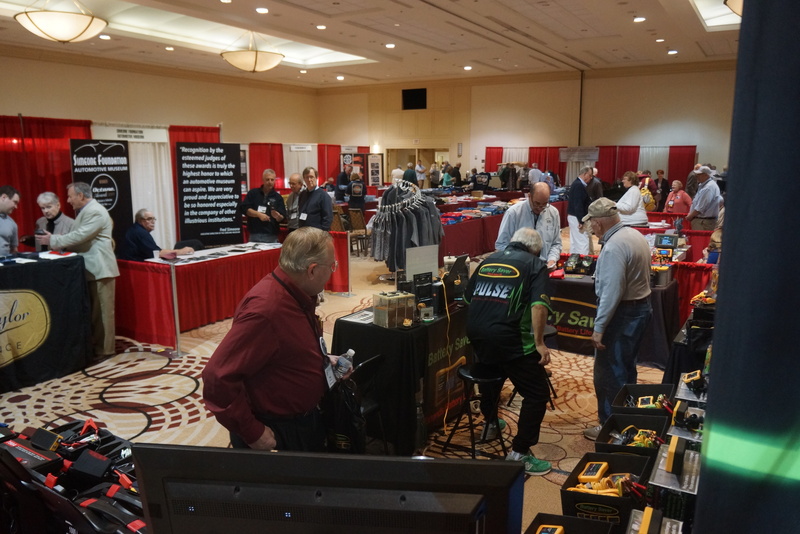 In parallel, a Trade Show is on site, populated by businesses which support lovers of old cars. For someone like me who attended only on Friday, there is lots to see and do. 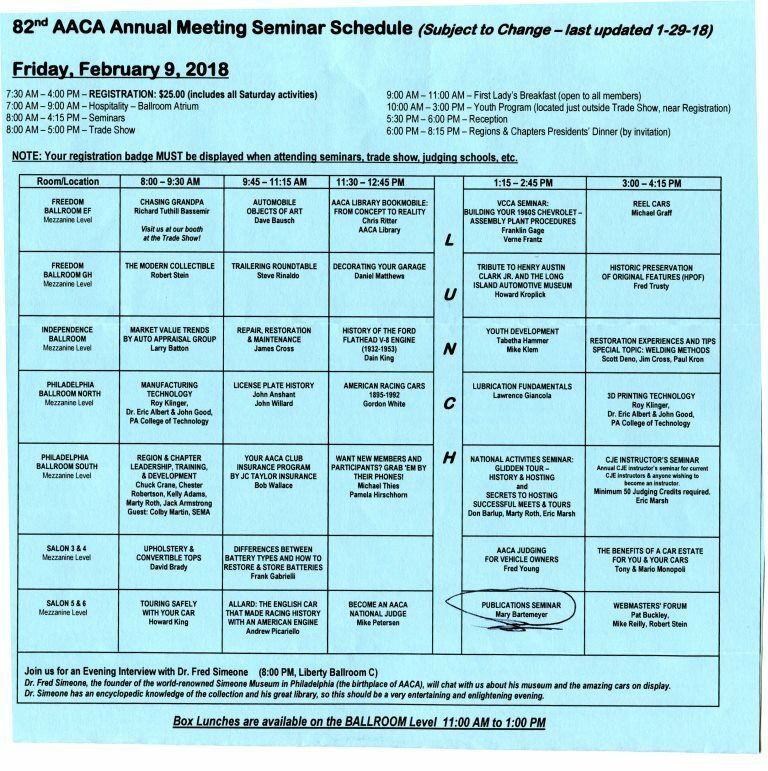 If there is an issue with the Seminar schedule, it’s that one cannot attend every seminar of interest! There are five time blocks during the day on Friday, but each time block is hosting SEVEN different seminars in seven different rooms. So you need to pick the most interesting one. Given that each time block is 90 minutes, there is the option of jumping from room to room, with the obvious downside of potentially missing something interesting. 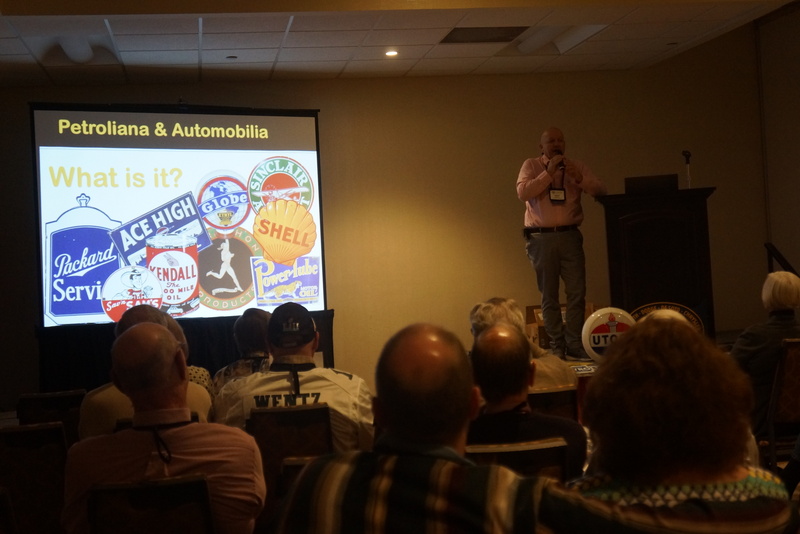 I began Friday morning in the “Market Value Trends” seminar, hosted by the Auto Appraisal Group (AAG) Company. 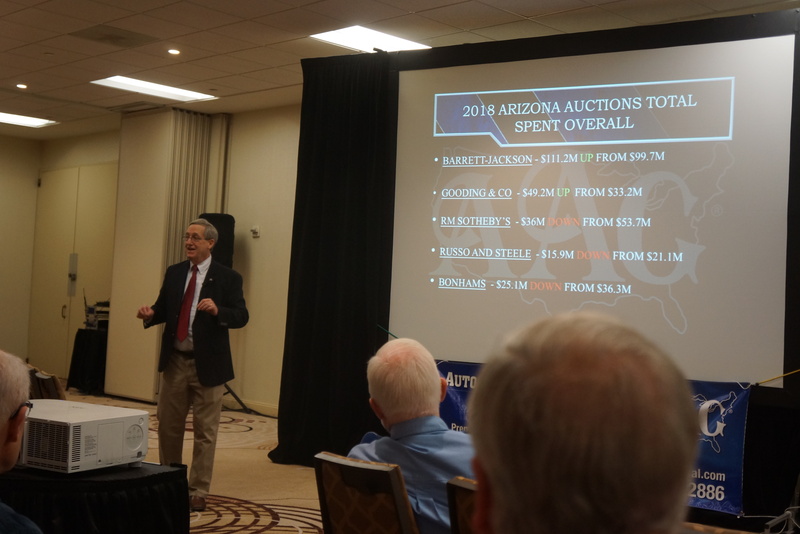 Larry Batton was the presenter, and he showed us various slides which crunched the sales figures from the most recent (Jan. ’18) Arizona auctions. By his own admission, Larry is a numbers guy, and of course, dollars are numbers. One of his more interesting observations was summarizing “average sale price” for the auctions MINUS the $1M+ sales, and MINUS the charity sales (which tend to be beyond “fair value”). It gave a somewhat refreshing look at what cars really sell for, once these outliers are struck from the equation. He also regaled the audience with a humorous story about a man who “bought back” his own car at an auction, and in doing so, set a world’s record price for that make and model. A few months later, the owner tried to sell the car privately, claiming that the car was worth what he bought it back for. Larry’s point? Do your homework, ask a million questions, ALWAYS ask to see the title, and seek professional help (a plug for his own company). 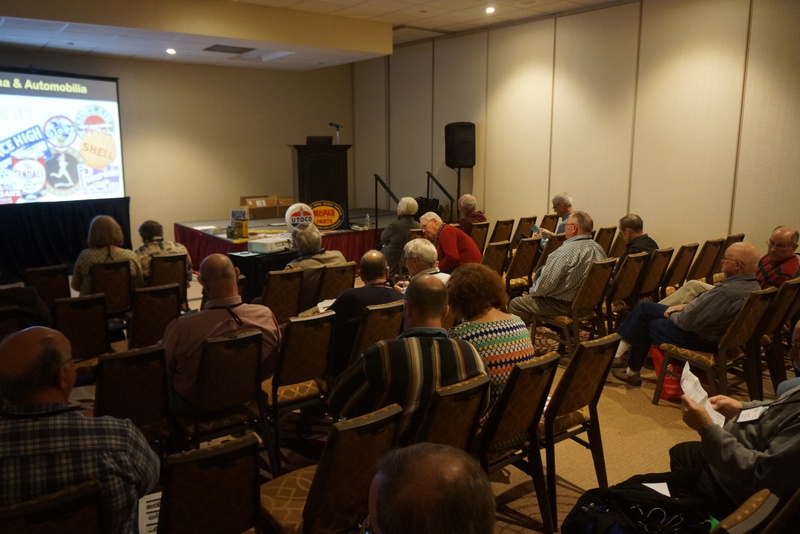 Next was a session called “Repair, Restoration, and Maintenance” by James Cross. Jim approached his topic in a folksy, low-key, somewhat random way. He’s an old-school, likely self-taught restorer who has focused much of his own collection on pre-war cars (he owns a 1909 Buick). 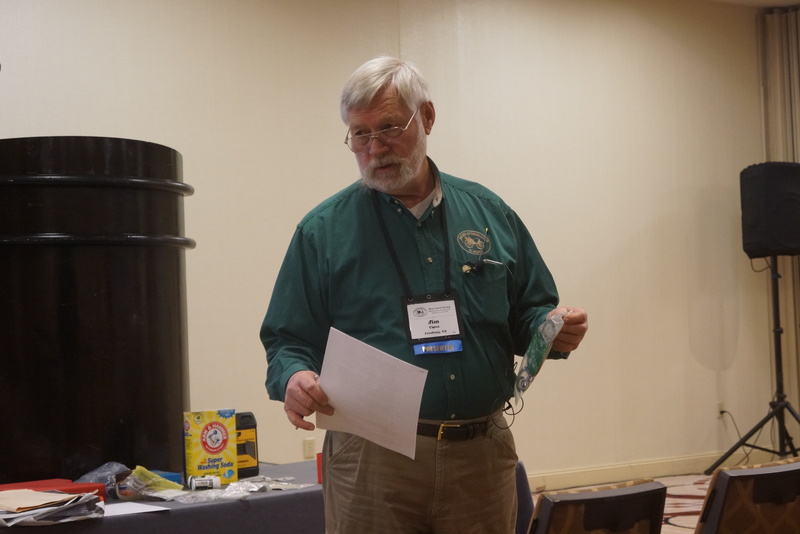 He entertained AND educated us with his list of home-brewed remedies (for example, ketchup will clean the outside of brass radiators, and Arm & Hammer Super Washing Soda will clean their insides). One topic covered by Jim which inspired quite a bit of Q&A from the audience was the repair and restoration of wooden wheels. Based on participants’ reactions, your humble blogger was pleasantly surprised to learn that so many hobbyists still have a need to know how to do this. And this observation brought out the one issue with this presentation (which does not cast the slightest aspersion on Mr. Cross): the room was full of old white men, not one of whom was under the age of 50. All this knowledge is great stuff; but how does it get transferred to succeeding generations? This is not an original thought, of course, and yet it remains a vexing issue for the entire old car hobby. The third and final morning seminar that I joined was given the somewhat misleading title of “Decorating Your Garage”. 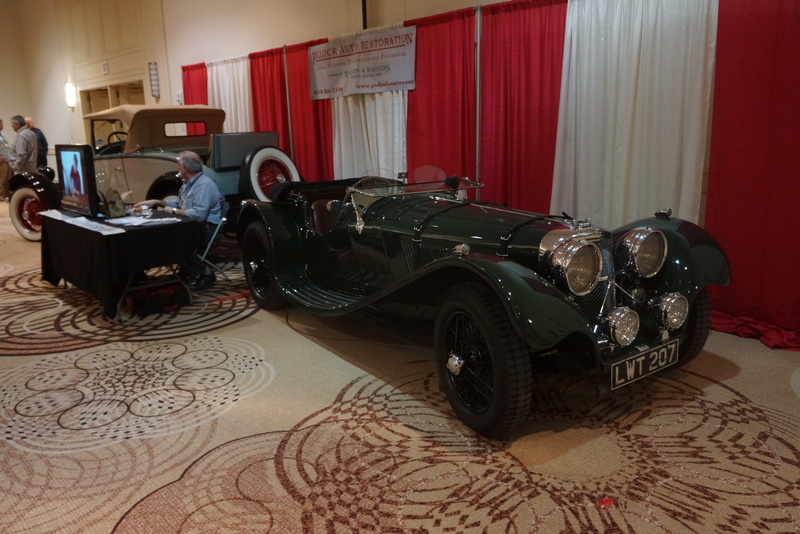 Dan Matthews, the presenter, is an extremely knowledgeable expert in automobilia and petroliana, having written three books on the topic. His main focus was giving advice to the audience about distinguishing “real” tin and porcelain signs from “reproduction” ones. His fast-paced delivery did not always mesh well with his goal, but it was enough to highlight some of the clues one should look for. It helps if one has some basic knowledge (he was able to rattle off statistics such as “there were only 12 made of this particular sign, and the last one sold for $20,000”), and perhaps one of his books on the subject would help the serious shopper. At the end of the day, the warning is one we’ve heard many times before: “if the price seems too good for it to be real, it probably isn’t”. My two post-lunch choices were much more AACA-specific. 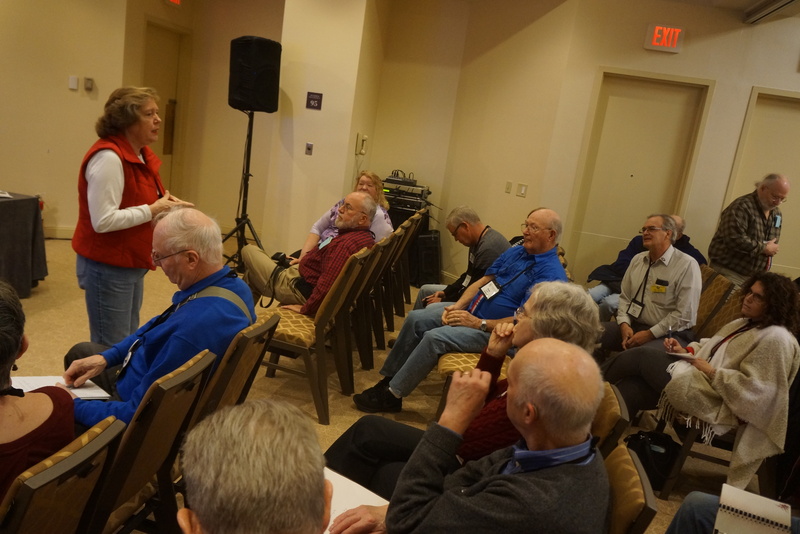 The “Publications Seminar” hosted by outgoing AACA Publications Chairperson Mary Bartemeyer was designed solely for those who work with their own Regions’ newsletters. (Starting this year, I will be taking a more active role in writing for the NJ Region’s newsletter.) 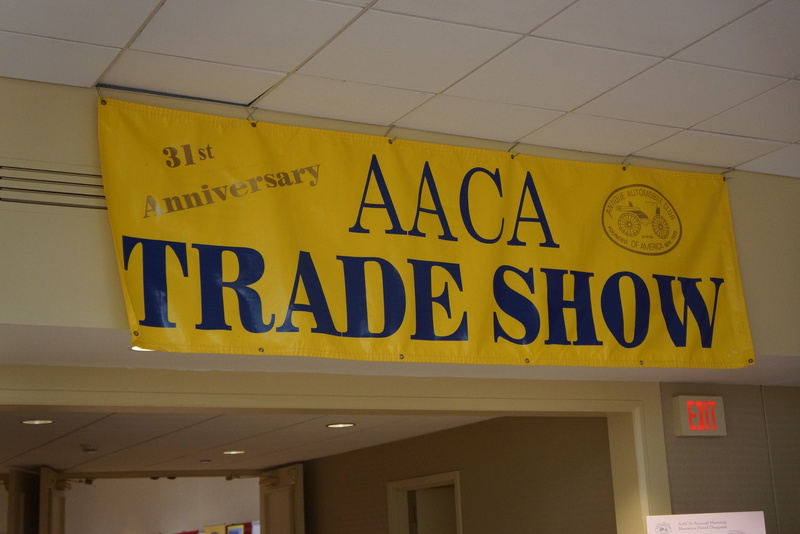 AACA has a long list of “do’s” and “don’ts” for these newsletters, and there is special focus on copyright infringement. We were all admonished that you simply cannot take a photo off the Internet and reprint it in your newsletter. We heard one sad story about a Region which violated a copyright and was contacted by an attorney. When the Regional representative said “hey, we’re sorry, we’re just a non-profit club”, the attorney’s retort was “too bad, this is the amount it is going to cost you to settle or we’re going to court”. Mary made the point that the Club’s insurance does NOT cover such matters! 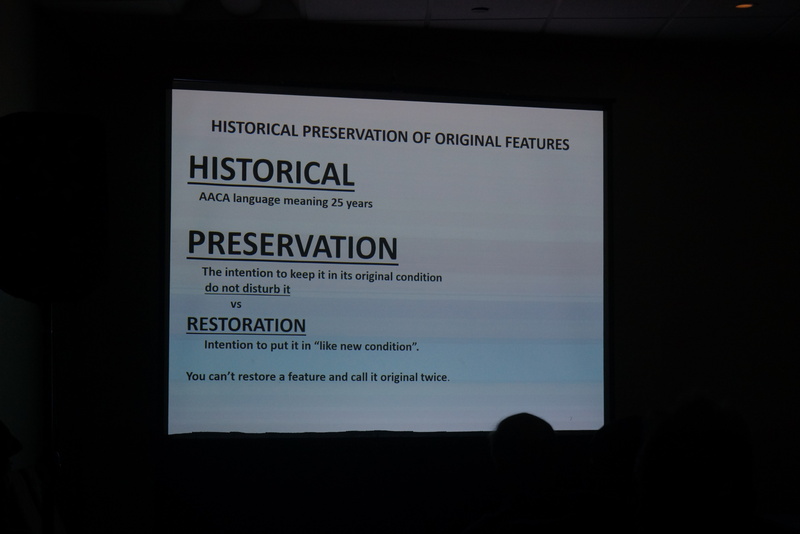 The final seminar for me was simply called “HPOF” (in AACA-speak, that’s Historical Preservation of Original Features). 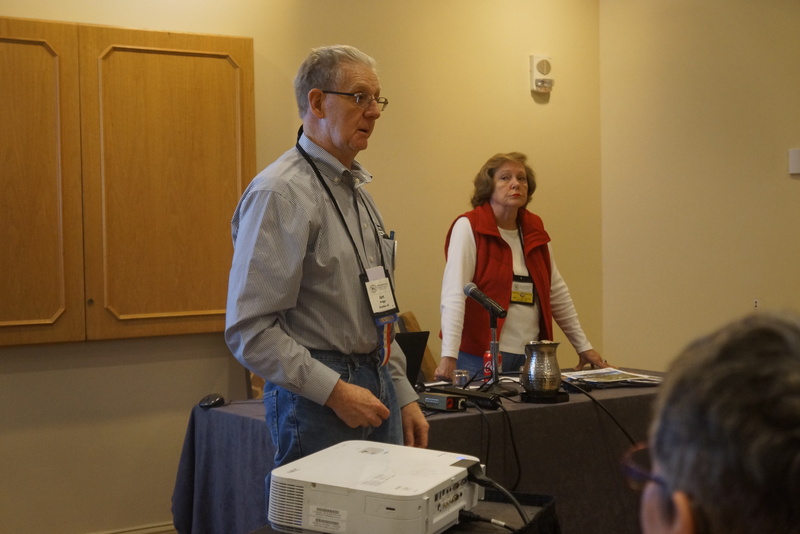 The presenter was Fred Trusty, who is the Chairperson for HPOF. He started with an interesting look back at the origins of HPOF. This new class one born in the late 1980s in part from the realization that many of the vehicles entered into Class Judging were over-restored, and it was no longer possible to literally see how the factory made these cars. Preserving an original car as “original” was deemed to be in the greater interest of the hobby. 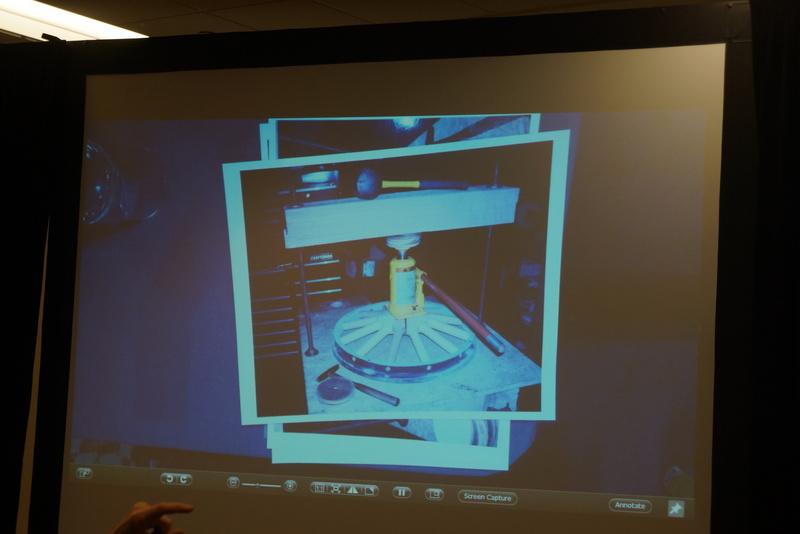 HPOF started off recognizing cars 45 years old and older; that cutoff was then moved to 35 years, and then again to where is it today, cars 25 years old and older. 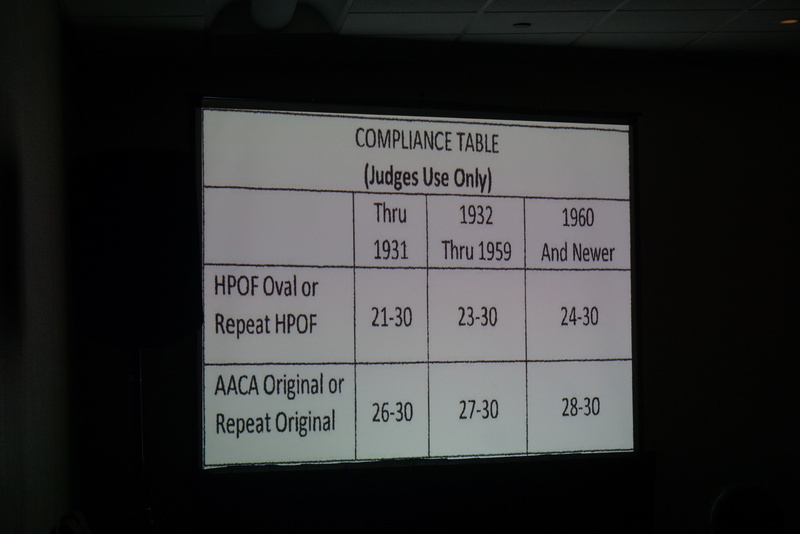 HPOF judges would rather see imperfect yet original, instead of perfect but non-original. There are some grey areas, such as re-painting, however, that also depends on the vehicle’s age. Regarding paint, two examples were given: a 1920s car that was repainted once, in the 1940s, probably has so much patina that judges cannot tell with absolute certainly how old the paint is. The car would likely be judged to be “original”. On the other hand, a 1970s car with a complete repaint would not be considered eligible for HPOF. I have a more than passing interest in this class, as my 1967 Alfa Romeo already has its HPOF award, and one of my challenges as its caretaker is to maintain it in as close to original condition as possible, while still driving it about 2,000 miles per year. I also intend to enter my 1993 Mazda Miata (it turns 25 this year) in the HPOF class at Hershey in 2018. I’m anxious to see if it qualifies for an award. 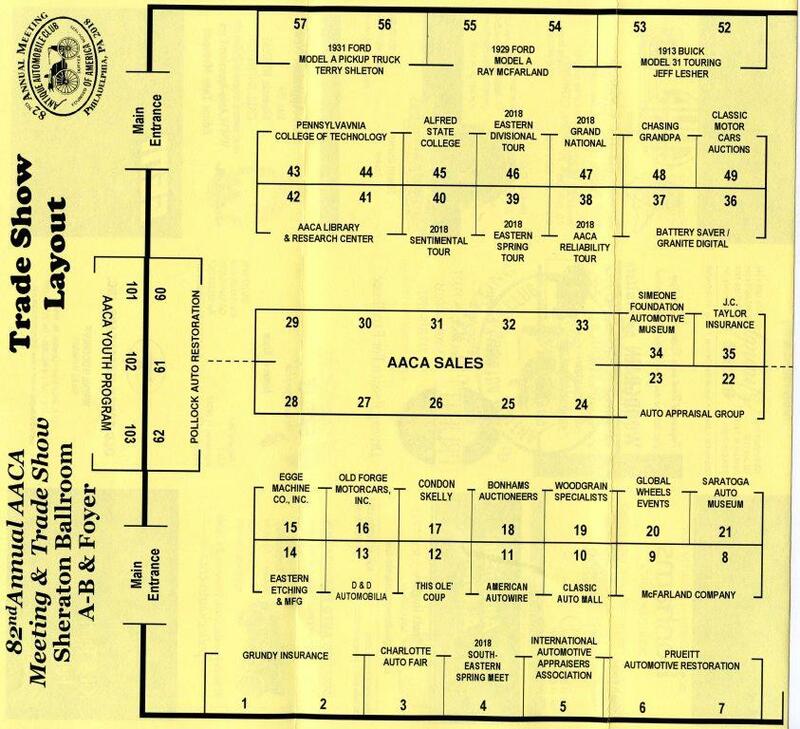 If you are an AACA member and have not attended an Annual Meeting, I highly recommend that you do so. 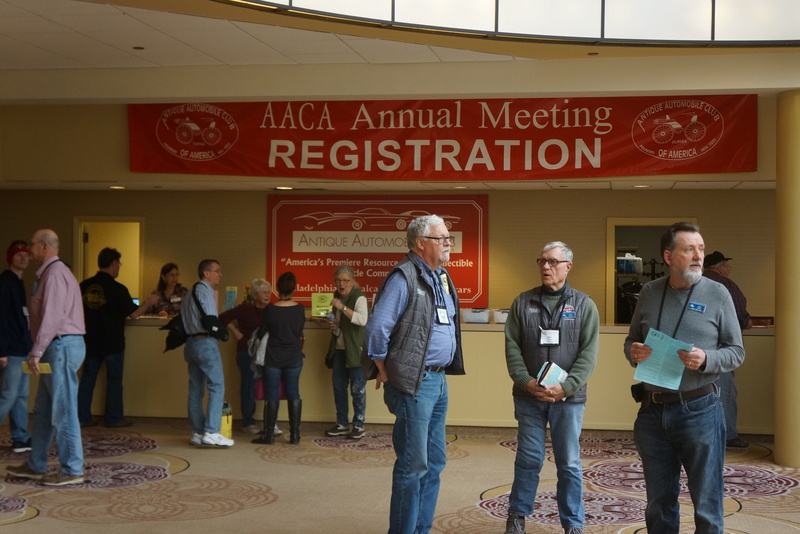 If you are not a member of AACA and are interested in old cars, the history of old cars, and preserving history, I strongly recommend that you join. Ownership of an old car is NOT a prerequisite. For me, the best part about my membership is conversing with like-minded individuals. You were maybe expecting Chapter Five of the Isetta Saga? It’s coming along nicely, and you’ll read all about it next week, promise. The original Mazda Miata debuted in the summer of 1989 at the Chicago Auto Show. The first vehicles were 1990 models, making them 28 years old this year. At the time of its introduction, the traditional affordable 2-seat roadster had all but disappeared (Austin-Healey, MG, and Triumph were gone). The Miata’s closest competitor was the Alfa Romeo spider, riding on a body/chassis design that had been introduced in 1966. It seems like you picked some choice seminar topics. Interesting numbers at the different auction venues. 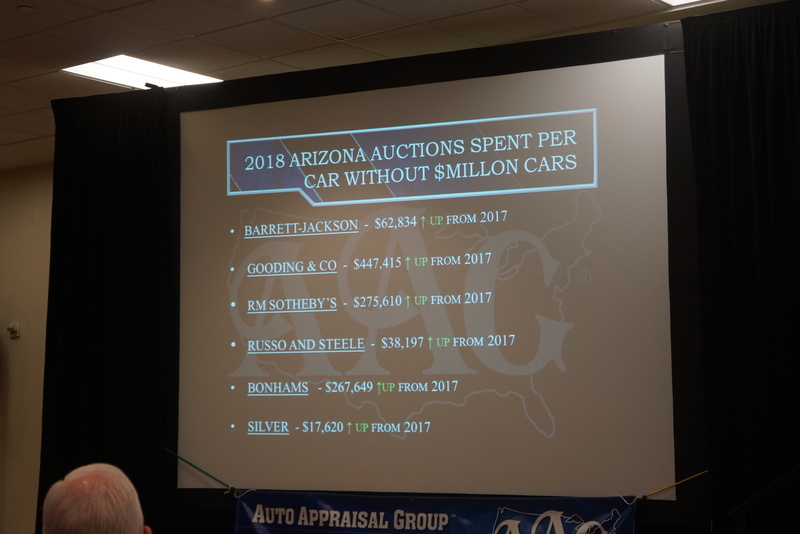 Even though the total sales $ were down at three of the auctions shown on the slides, the $ per car were up at all of them. Good for you to stay up-to-date on the originality gospel. Still, a Miata as a “historical” vehicle is hard for me to get my head around but the calendar doesn’t lie! A random observation based on the photos of the attendees and presenters leads me to conclude that Levis must have sponsored the meeting. Hi Bob, as always, I enjoy reading your comments and your observations. Yes, the idea of Miatas (or ANY early ’90s car) at Hershey is hard to fathom, but I fully support the AACA 25-year rule, as it gets more (and hopefully younger) folks and their cars out to the shows. RE: your “Levis” comment, I think that speaks to the average age of the attendees! Great article! I especially like the comment about the newsletter editor being sued. I am the webmaster for our AACA club (Westerly-Pawcatuck Region) and I am often asked to post submissions that consist of items cut out of a magazine. Folks just don’t understand why I say “I can only do this if I get permission”. Surprisingly it is often very easy to get permission and I have done so a number of times. In the most recent example I was able to run the full cover of QST magazine (a ham radio journal … I am a ham too) with permission that was granted within minutes of making the request. Hi, and thanks for your comment. It’s great to see someone from another AACA Region on here. PLease feel free to sign up for the email updates. There’s a new blog post about once a week.